Culinary ginger (Zingiber officinale) is the rhizome of the ginger plant. It belongs to the Zingiberaceae family, as does the turmeric plant. A reed-like stem grows out of the rhizome and the plant flowers after two years. The tropical climate loving ginger can be grown indoors in a cooler climate. It can be harvested in 4-5 months but only with a little piece of the rhizome at a time. In tropical climates, the plant can be harvested after ten months when the leaves have turned yellow and the stems die. 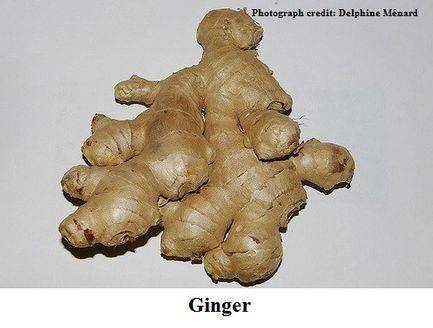 The ginger root has a pungent flavour without heat and is used to spice recipes and cure maladies. Gingerol in fresh ginger gives it its anti-inflammatory and antioxidant qualities. An unsettled stomach can be soothed with ginger. It can also control bloating and ease the symptoms of colic and diarrhoea. It acts as a decongestant and should be taken several times in a day for respite from a cold or flu. Ginger is beneficial for reducing morning sickness and nausea in general. Applying a paste of ginger and turmeric (warmed up) on an area of the body affected by gout, rheumatoid arthritis, or osteoarthritis can bring great relief from pain. It is a natural painkiller and can be taken in the form of a tea to alleviate period cramps. Ginger can be ingested as a preventative measure against muscular aches and pains. It may play a role in helping control diabetes and cholesterol. Raw ginger has anti-cancer properties. Ingredients: Freshly extracted milk of 1 coconut / 300 ml of readymade coconut milk, 1 medium red onion, 3-4 green chilies, 2 tsp of chili (Kashmiri mirch) powder, 3 tsp of turmeric powder, 3-4 cloves of garlic, ½ tsp of cumin seeds/powder, ¾ tsp of dried mango powder, 2 tsp of salt/ to taste, 250 gm of prawns and 250 gm of ladies’ fingers. Method: For fresh coconut milk, grate the coconut and combine the chili powder, turmeric powder, garlic, cumin and 2 glasses of water in a mixer-grinder/blender. Pass it through a sieve and squeeze the milk out of the mixture. Put the squeezed mixture back in the blender with two glasses of water. Use the above method to extract the milk. 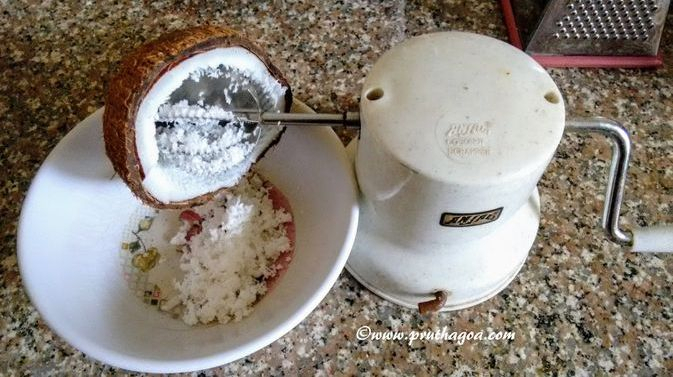 The easier and faster method is to use the readymade coconut milk. For both methods, chop the onion finely and sauté in two tbsp of oil in a saucepan. Add green chilies (whole with a small slit in them). 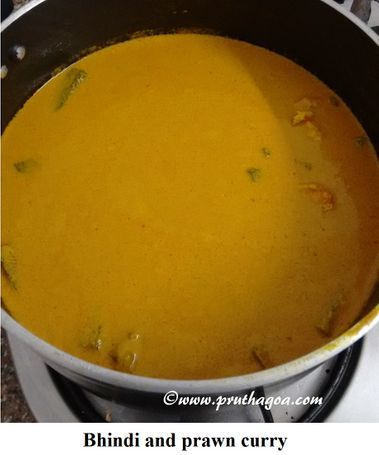 If using readymade coconut milk, blend the garlic, cumin, red chili powder, turmeric and add this mixture to the chopped onion and green chilies in the pan (The mixture with freshly squeezed coconut milk is added directly to the saucepan with onions). Fry for 2-3 minutes before adding the coconut milk. On a low flame, bring the mixture to a boil while stirring intermittently for about 20-25 minutes. Add the dry mango powder and salt. You can use tamarind/ dry kokum (Garcinia indica) instead of dry mango powder. Finally add the ladies’ fingers and bring the curry to a boil on a high flame for about 3 minutes and let them cook for about 15 minutes on a low flame. Add the prawns and let them cook for three minutes and turn the flame off. If the curry becomes too thick, you can add some hot water. 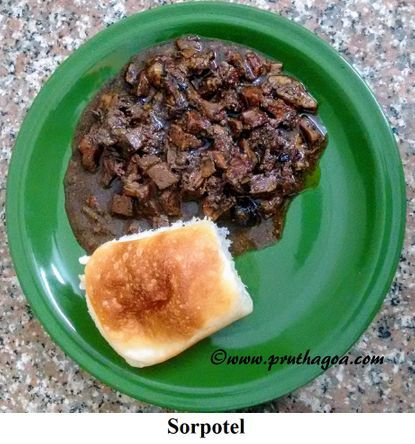 Ingredients: 1 kg of pork, 1 portion of innards (heart, liver, and kidneys), 10-12 tbsp of coconut vinegar, 1 medium onion, 1 green chili, 1 tbsp of red chili powder, 1 ½ tbsp of pepper, ¾ tbsp of clove powder, ¾ tbsp of cinnamon powder, 1 tsp of jeera powder, 10 cloves of garlic, 3-4 tsp of sugar, 2 tbsp of oil and salt to taste. Method: Boil the pork and innards with 6 tbsp of vinegar for 20 minutes on a medium flame. Let the meat and innards cool. Then cut them into small (a little more than ½ an inch) pieces, fry in a pan and keep aside. Chop the onion and chili finely and sauté till dark brown. Add the red chili powder, pepper, clove powder, cinnamon powder, jeera powder, paste of 10 cloves of garlic and combine the ingredients and fry till the oil separates from the masala. Add the chopped meat and innards, 2-3 cups of water, sugar, salt, and the rest of the vinegar. Bring to a boil and lower the flame. Let it cook for about 40-45 minutes. Add more water if required. You can add some feni/port wine (1/4 cup), but this is not necessary. Remember, the more you reheat this dish, the better it tastes. For weight loss: Prepare a decoction of 2 inch ginger root, boiling down three glasses of water to one and add the juice of half a lime to it. Have it heated up in the morning before you eat anything else to experience weight loss. For flu and cold: Boil a two inch piece of ginger, finely chopped, along with the tender ends of three stalks lemongrass with three glasses of water for about 15 minutes. Strain the concoction and add a tablespoon of honey to it. The mixture will help with congestion and decrease body ache.